YouTube is getting into the TV streaming business with a new service they're simply calling YouTube TV. 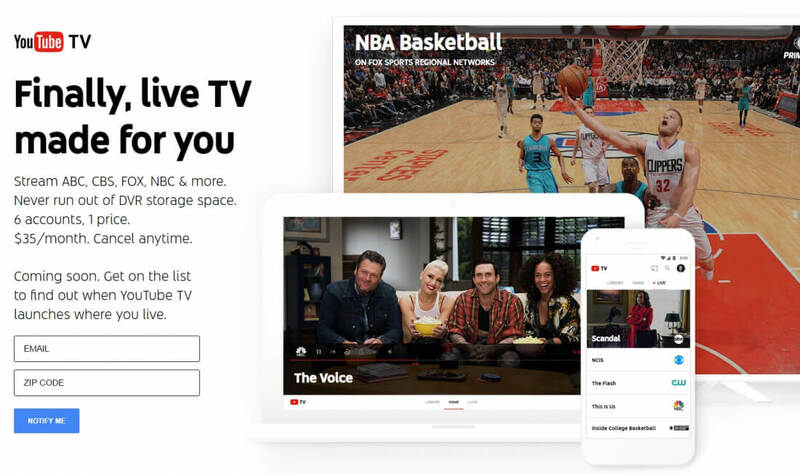 Set to compete with the likes of Sling and PlayStation Vue, YouTube TV will combine live streaming of popular broadcast and cable TV channels with all the content available on YouTube. When the service launches in the coming months, it will cost $35 per month. For this price, you'll get roughly 40 channels, including all four major networks (ABC, CBS, FOX and NBC) along with a range of cable channels such as ESPN, USA, FX, Disney Channel, Syfy, and National Geographic. You can see the full list of channels included with YouTube TV here, and there are some notable omissions. YouTube TV won't include any channels from Viacom, Turner, AMC, Discovery, A+E or HBO. This means the service won't include CNN, TNT, AMC, Comedy Central, HBO, MTV, TBS and more. Showtime will be available, but at an additional cost. YouTube TV will also include access to all YouTube Red Originals, which are shows created by YouTube personalities that can only be accessed through a paid YouTube Red subscription ($10 per month). Strangely, YouTube TV does not include the other benefit of a Red subscription: ad-free YouTube viewing. To get an ad-free YouTube experience on YouTube TV, you'll also need to be a YouTube Red subscriber. On a more positive note, it sounds like YouTube TV will have a robust set of features. Its monthly fee includes six accounts, which allows each household member to have their own account with personalized recommendations. You'll be able to watch up to three streams simultaneously. The service also comes with a cloud DVR system with no storage limits. Users will be able to record an unlimited amount of shows simultaneously, and this won't use any data for those accessing YouTube TV on a mobile device. Any shows that are recorded will be accessible for nine months. YouTube TV will be accessible though the YouTube TV website, a new and separate YouTube TV app, or through Chromecast. The app is split into sections for live content, recorded content, and recommendations. There is also a robust search system that includes the ability to search for shows with a certain theme. There's no firm launch date for YouTube TV, aside from "the coming months", but anyone interested can sign up for notifications through the new YouTube TV website.